This Instant Pot Beanless Beef Chili is perfect for 21 Day Fixers and all my Whole 30/Paleo friends, too! 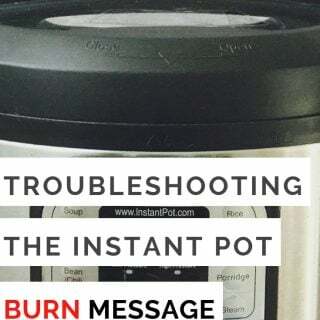 And while it’s easy to adapt to the stove top, it so simple and quick in the Instant Pot(affiliate link)…perfect for a busy weeknight! 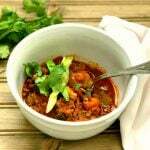 I seriously could eat this Beanless Beef Chili every week. Despite the fact that it’s April, it’s cold and rainy here today…and while I would normally be posting a recipe for the grill at this point in the year, right now, all I can think about is warm and cozy comfort food. 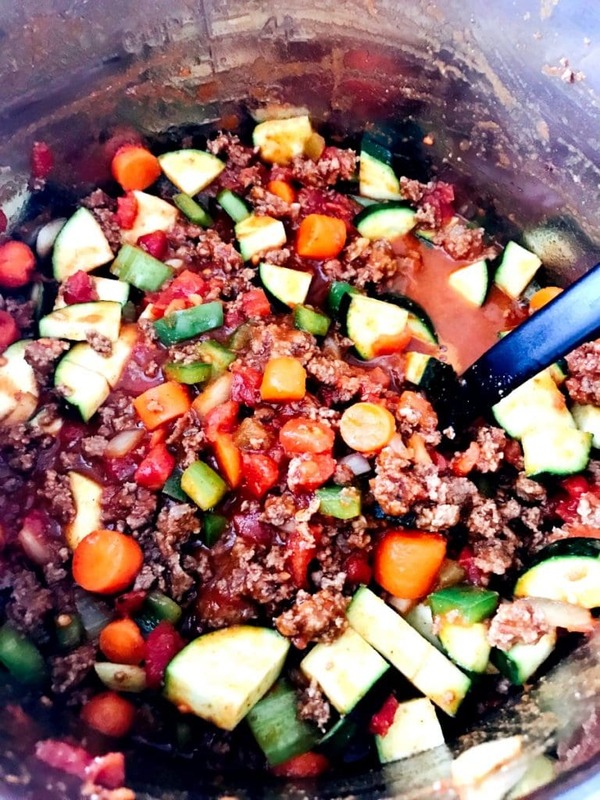 I made this Chili for us during the March Blizzard we had here in PA…right around that time I decided to do a trial of no dairy and no grains for awhile. Basically a strict Paleo diet, but using the FIX for portion control. We’ve been gluten free for some time now, but I have been feeling extra bloated lately. It’s frustrating when you workout almost daily, but your pants still feel tight. My eating wasn’t that great, in all honesty, and I was craving more junky foods and carbs than usual. So it was time for a little change. Not only is this chili dairy free, gluten free, and grain free, it also bean free, as most who follow a Paleo approach to eating avoid beans due to lectin content, carbs, and how difficult they are for some to digest. I didn’t know how my husband would feel about a beanless Chili…but he was totally down. You honestly don’t even miss them with all the hearty veggies and delicious ground beef. And not only was it husband approved, my toddler kept asking for more! Win! After several weeks of Paleo eating, I definitely felt less bloated and even lost a few pounds! My sugar and carb craving was also dramatically reduced. And then my husband and I had an improptu date night with pizza, wine, and chocolate cake…and I realized I could never commit to a full time Paleo life. But part time. Part-time Paleo is perfect . What do you think? Have you tried Paleo eating? Is anyone else interested in some more Paleo friendly recipes? Let me know – I love hearing from you! 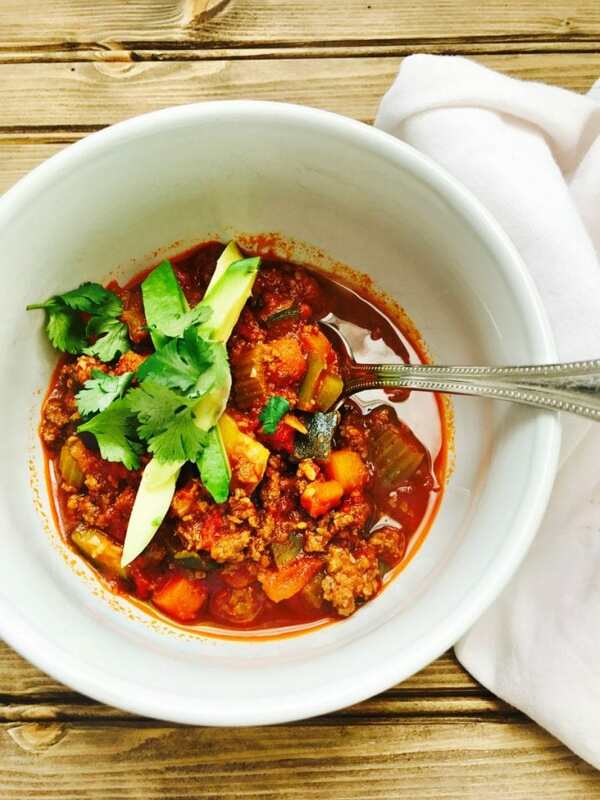 This Instant Pot Beanless Beef Chili is perfect for 21 Day Fixers and all my Whole 30/Paleo friends, too! And while it’s easy to adapt to the stove top, it so simple and quick in the Instant Pot…perfect for a busy weeknight! Set your Instant Pot to Saute and brown beef until beef is thoroughly cooked, adding garlic for the last minute. Drain excess fat, set aside. Add oil, onions, celery, carrots, peppers, and seasonings to the Pot and saute until onions are translucent. Add zucchini, cooked beef, tomatoes, and sauce to the pot and stir. Cover IP and be sure valve is set to sealing. Set to manual and cook for 20 minutes. After cook time, switch to venting for quick release. Top chili with cilantro and avocado, if desired! For the Stovetop – In a large saucepan or dutch oven, brown beef until beef is thoroughly cooked, adding garlic for the last minute. Drain excess fat. Remove beef from pot and set aside. Add oil, onions, celery, carrots, peppers, and seasonings to the pot and saute until onions are translucent. Add zucchini, cooked beef, tomatoes, and sauce to the pot and stir. Bring to a boil over medium high heat, then reduce to a simmer. Cook for 30-45 minutes or until veggies are tender. Just made this tonight, delicious and filling for me and toddler approved! Made this tonight and my family LOVED it and so did I!! One question, and I might be overlooking it, but how much is one serving? I see the container counts but not how much an actual serving is. Thanks!! Hi! My recipe card is super glitchy right now – sorry! One serving is 1 1/2 cups! Looks yummy! We don’t eat a lot of beef. Do you think this would work with ground turkey? Would the cook time be the same? I do!! And yes – totally the same cook time!! This Chili is AMAZING!! I have always liked chili but my body doesn’t love digesting bean so I usually try to avoid it. When I saw this bean less recipe, I knew I had to try it. This bean less chili is delicious and great as left overs too! I made this last week and will be making it again this week. Thanks for the great recipe! That’s awesome, Katie!! My body is the same way with beans!! How many servings does this make? It seems like it makes a lot so I might want to cut the recipe in half. Nancylynn – this is simply amazing! I swapped out the beef for ground turkey and the meat and veggies were so tender and flavorful! I used it for my meal option 3 on 80 day obesssion with an orange of seeds. I am not a bean person so I always struggle finding chili recipes that don’t include them. Thank you! This is the second time I’ve made this recipe! The first version was great, but a little too spicy for my taste… although it all got consumed, nonetheless. It was a nice go-to in my freezer. For this version, I cut the cayenne in half, and it’s perfect for me! Love all the healthy veggies that replace the beans! 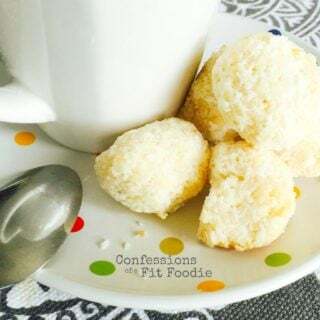 Thanks for another winning recipe, Nancylynn! This is how I make it, but you can honestly cut the time down as little as ten minutes!! The meat is already cooked, so you will be fine!! I would just measure 6 cups of veggies out of the choices there! I love this recipe. I like the flavour of Chili but I hate beans so I gave this a try and it’s awesome. I’ve made it twice now. So good. I do have one question though, both times I made it my Instant Pot wouldn’t pressure up. The second time I made it I added 3/4 of a cup of broth hoping it would. Anyone else have this issue?? I’ve not had that issue when making this specific recipe, but once mine wouldn’t pressure up even though three was plenty of food volume. After consulting the user’s manual, I ended up removing and cleaning the little silicone cover for the pressure valve. This did the trick for me! I don’t have an instant pot, so do you think this recipe would work in the Crockpot or on the stove? Thanks! Great! I will try it in the Crockpot. Thank you!!!! I added stove top directions just now! If you want to make it in the slow cooker, follow the first twi directions for stovetop, then add everything into the crock pot for 4 hours. This recipe has been a crowd pleaser! I’ve made a double batch once a week and deliver it to family members who are requesting the chili. I love that it’s packed full of veggies and so delicious! Hands down the best chili I’ve ever had! Oh my goodness!! Thank you for making my day!! Made this tonight with half ground lamb we were given from a friend and ground beef. Sooo delicious! And perfect for shift shop! Thanks for sharing all your recipes! They make us feel like we never are eating on a diet with portion fix! Is that two regular size cans of rotel? (Like 14 oz?) Or are the tomatoes with peppers something else? I was skeptical my family would like this, simply for the fact it had cooked zucchini in it. My 15 year old, pickiest eater EVER liked it. I’m still in disbelief. She’s even taking it for lunch tomorrow at school! Success! Will definitely be making again! Thanks so much for sharing! Wendy – I know the feeling! I am SO happy this was a win for you guys! Thanks for taking the time to comment – I love hearing from my readers! 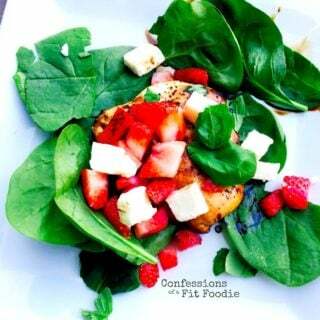 I’m on 21 day fix and I made this and was sooooo pleasantly surprised. Didn’t know chili could be so tasty! My husband hates beans but I really like them so I thought I would miss the beans. The veggies and spices were delicious and the instant pot made it so quick and easy! Great for a quick lunch the next day. Thank you, thank you! Hi! This makes me SO happy! 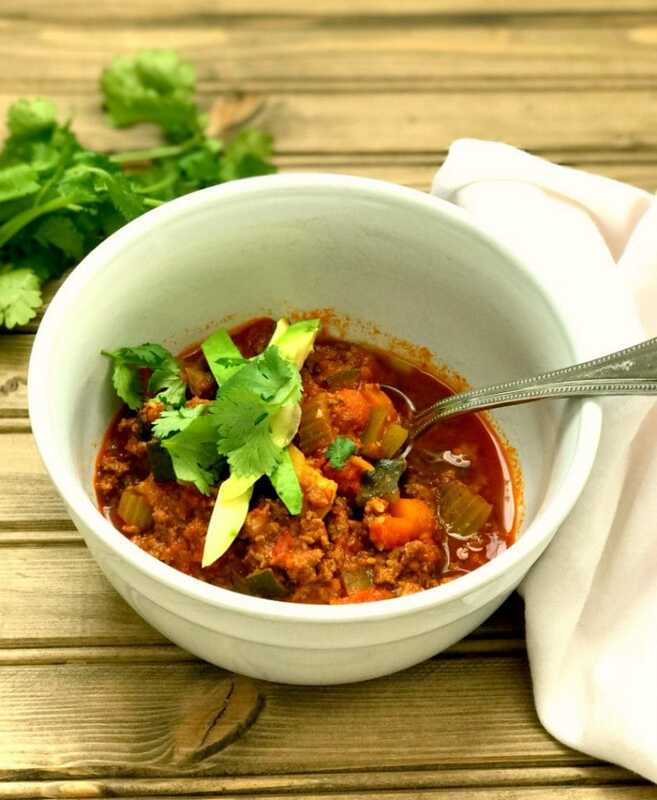 Thanks for taking the time to write and leave a review – this chili is def a favorite in our house and I am thrilled to hear you guys enjoyed it! Love this stuff and have to share what I did with the leftovers because it was about the best.thing.ever! I didn’t have quite enough leftover for a full lunch serving so I randomly heated up what remained of it and put a runny fried egg on it. I ate it for an AMAZING savory breakfast. SO INCREDIBLY DELICIOUS! 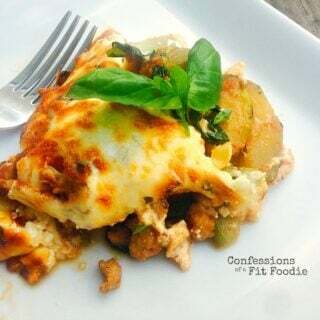 I’m seriously considering making another batch so I can use it for my meal planned breakfasts for the week! Oh…I used ground turkey and have made both in the IP and on the stovetop. Always delicious! Mary Jo, this is AMAZING. Thank you so much for sharing and I will totally be making this myself ASAP! YUM! I made this last night in the Instant Pot for my family and everyone loved it!!! I served it over small baked potatoes for the kids with shredded cheese and sour cream, and my husband and I just had it by itself with chopped avocado. My kids even had 2nd helpings, so that means it was REALLY, REALLY GOOOOOOOD! Thank you! Your recipes are always winners for me! YAY!!!!! 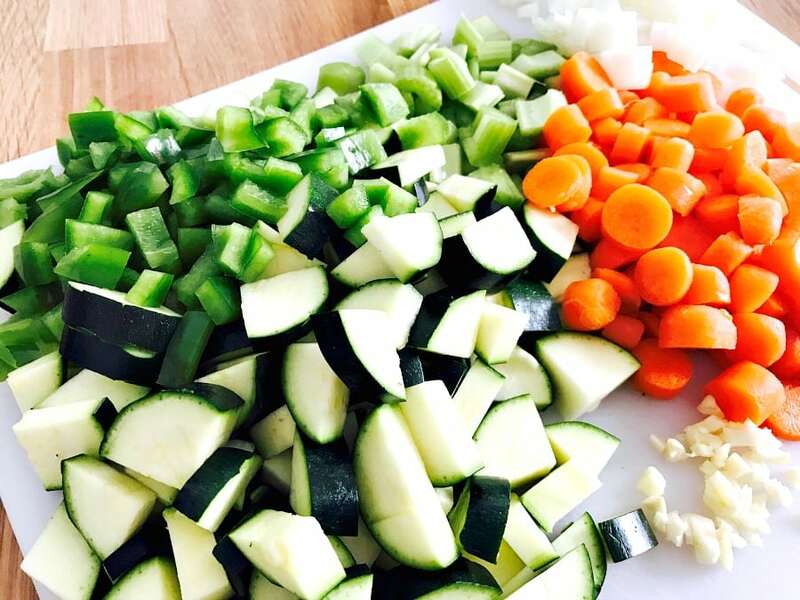 This makes me really happy to hear – and I love that your kids ate this over baked potatoes! What a great idea! This is a great chili! Since my hubs is diabetic and we are both on weight watchers- this recipe Rocks! Don’t even miss the beans!!! Oh, perfect! Thank you for taking the time to rate and review – means so much! !